A guide to Pittsburgh fireplace maintenance. Keeping the bricks inside your fireplace is important for three good reasons: aesthetic, cleanliness and air-quality control. While cleaning a fireplace hearth is known to be a cumbersome task, it’s a task shouldn’t be overlooked by homeowners. As the residents of West Pennsylvania succumb to the frigid temps of January and February, your friendly Pittsburgh fireplace installation experts at Ed’s Woodshed have a few tips to get your fireplace in clean and working order today! The classic soap, water and salt method works just fine, but does entail some serious elbow grease! Mix equal parts, or one ounce each, of soap and salt with water to create a creamy solution. Be sure to create a paste, not a watery mix. Next, use a hand towel to coat the bricks, allowing the paste to soak for a minimum of 10 minutes. Use a stiff bristle brush to scrub the bricks. This relatively natural and gentle homemade cleaning solution should do a decent job ridding the bricks of dirt and soot. you may need to concoct or buy a stronger solution. Old school ammonia has been used for cleaning for generations. This strong-smelling, powerful product works wonders when diluted, but be sure to open your windows and doors(yes, even in the middle of the frigid winter) because the odor is over-whelming. Mix a minimal amount of ammonia with soap and water, increase ammonia as you see fit. For a more effective solution, add pumice to the mixture. Apply the solution to the brick and allow it to dry completely. Using a wet scrub brush, remove the mixture to reveal the clean masonry! If the ammonia mixture doesn’t cut it, purchase a naptha bar at your local home improvement store. Shave it into small pieces and add it to boiling water, about three quarts. Allow the pieces of soap to melt. Once the naptha/water mixture cools, add the pumice and a bit of ammonia and apply this mixture to the brick for an at least an hour. Scrub and rinse with warm water. If you have kids or animals, Ed’s Woodshed suggests cleaning the brick further with detergent to remove any solution and odor left behind. Another common cleaning product you can purchase at your local retail or home improvement store is oven cleaner. Spray this directly onto the brick and follow the timing instructions on the label. 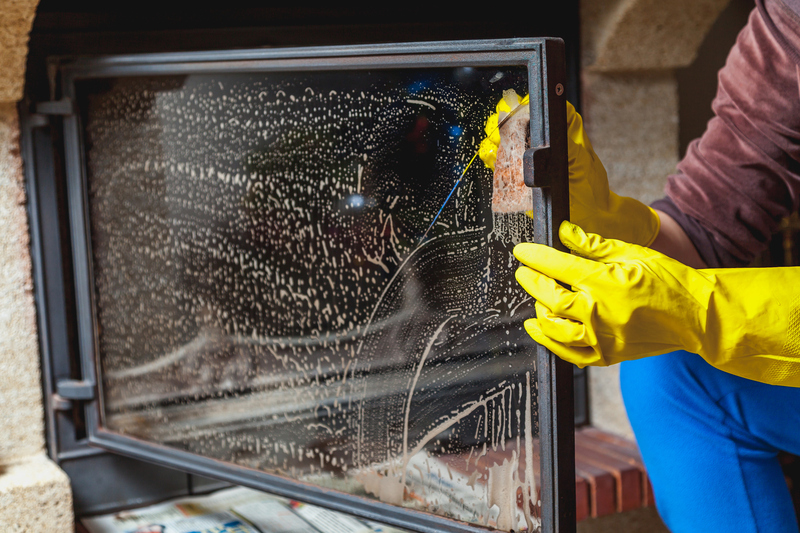 Using a hard-wearing towel, wipe off the oven cleaner and wash with soap and water. Fireplace maintenance in Pittsburgh is important when trying to keep a clean and healthy home. Dirt from the soot and grime in your fireplace will eventually make its way into your home, alternatively, burning this same soot and grime can compromise your home’s air quality. Lastly, clean brick is simply more visually pleasing in your family room! Call Ed’s Woodshed for all your Pittsburgh fireplace installation and fireplace inspection needs. If you don’t want to tackle cleaning you’re brick and mortar on your own, let us to the dirty work!